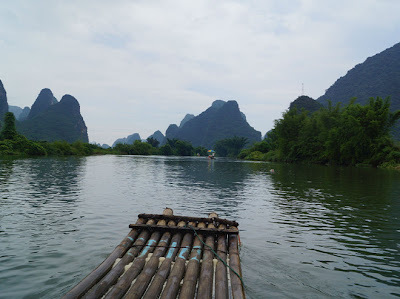 Yulong River is the biggest and most beautiful branch of the Li River in Yangshuo area.It is five kilometres away from Yangshuo.You will see the beautiful limestone peaks, pretty bamboos, rice fields, quiet villages along the Yulong River Valley. The beauty of Yulong can’t be influenced because of different climate, weather, or different point you stand. A different feeling occurs in different weather. A bamboo raft is a great way to check out the beauty of Yangshuo.It is a great experience and you can not miss.It’s very delightful to sit in a chair, float down the Yulong River on a simple bamboo raft and get back to nature. You can take pictures during the rafting: the reflection of the hills, bamboos or trees in the river, peaceful villages, green or golden fields, cultivating farmers and so on. There are ten dams in the river between Chaoyang Dock and Gongnong Dock, which are built to keep the water high enough to irrigate the farming lands. It is really thrill when the raft goes down the dams. It takes about one to two hours. As the area having the most beautiful scenery in China,biking in Yangshuo is a popular way enjoy the scenery and get a close look at like in rural China. Bike renting is available everywhere in Yangshou for about 20 Yuan/bike a day. 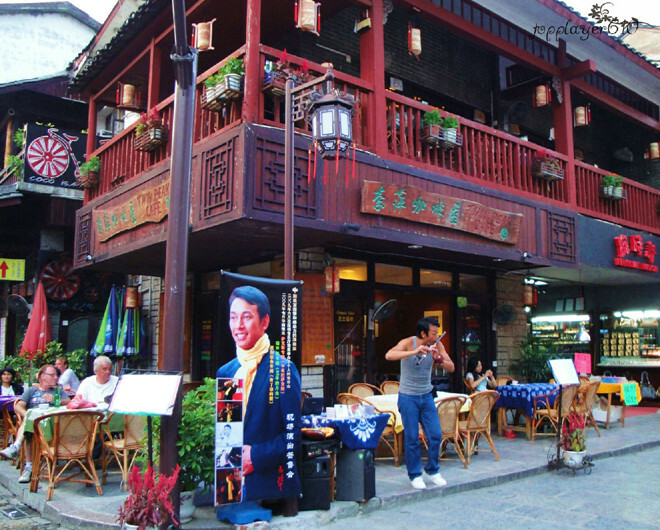 All the routes in Yangshuo will start at the West Street. There are several routes to follow and it is important to take the best routes. You can plan to take a half-day or an entire day of cycling. You can take a short Yulong river route if you want to view different scenic spots, villages, rivers, and hills in one short loop.You can choose rafting or other types of river activities in this place. This route measures 10 miles or 15 kilometers without other detours or Moon Hill so it would only take you half-a-day to finish the entire route. You’d pass by a small rural road that will eventually lead to the scenic and exquisite Yulong River. This route will get you past numerous tourist attractions close to Moon Hill. The entire bike ride with a total distance of approximately 26 kilometers and take half-a-day.You will view several tourist destinations like the rope bridge and several caves during the way. With a total distance of 55 kilometers or 34 miles, this route is much longer, but you can view the spectacular mountains that mark the most gorgeous Li River stretch. It would take you half-a-day to finish this route if you would be biking at an extremely faster pace.On the other hand, if you are planning to take it easy on the pedals, you will certainly be finishing this route in one day. Rock climbing is the type of sport that tests a person’s endurance and persistence. 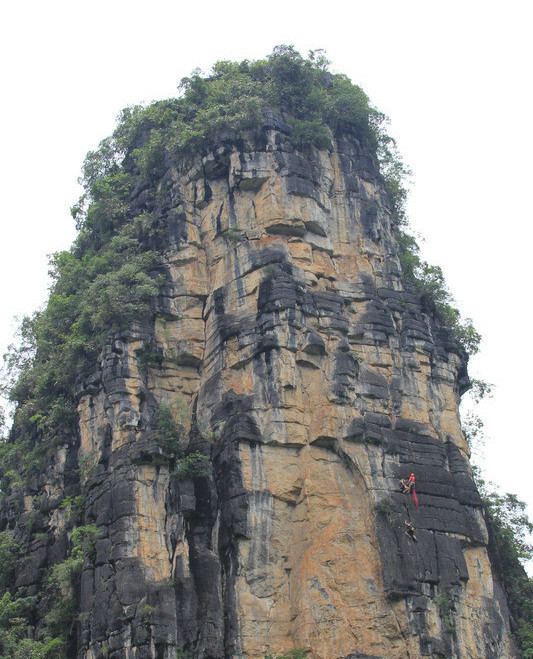 If you wish to stretch those muscles, Yangshuo is the perfect place to obtain the best rock climbing gear.There are many great hills to climb in Yangshuo.The Moon Hill is the most famous among all of them.It is a great limestone pinnacle with a naturally-created moon-shaped passage going through just below its summit. When you climb all the way to the top of the Moon Hill,you will be rewarded with a stunning 360 degree panoramic view of the surrounding peaks and countryside! West Street is the oldest and most famous street in Yangshuo.It attract many foreign tourists due to its antiquated style of being "half residences,half shops" and its courtyard-like environment.Located in the heart of Yangshuo, West Street is alive with cafes offering interesting Chinese and Western food. Travelers' can eat food from many different countries at very reasonable prices.It is also filled with small shops and vendor's stands selling all kinds of souvenirs and snacks. Impressions of Liu san jie is the largest live landscape performance. 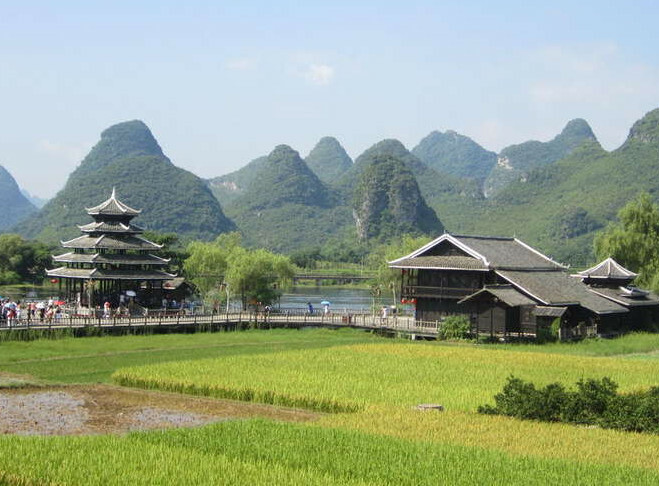 With the natural mountains and water as the setting, the performance,has become a must for visitors to Yangshuo. It is directed by Zhang Yimou who is very famous for directing the opening ceremony of 2008 Beijing Olympic Games. The performance expresses the stunning scenery, colorful ethnic culture and excellent art in China. 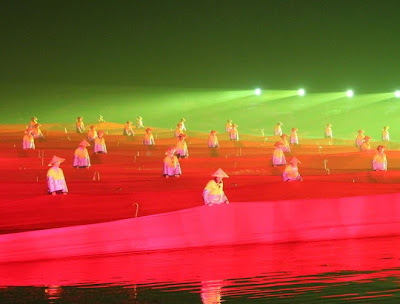 Combines the ciassical Sanjie Liu's Songs，ethnic groups’Culture and the fishing lights together, it fully reflect the life of villagers along the river.You can not miss it.